Could a stop here be next for Broadway hit? 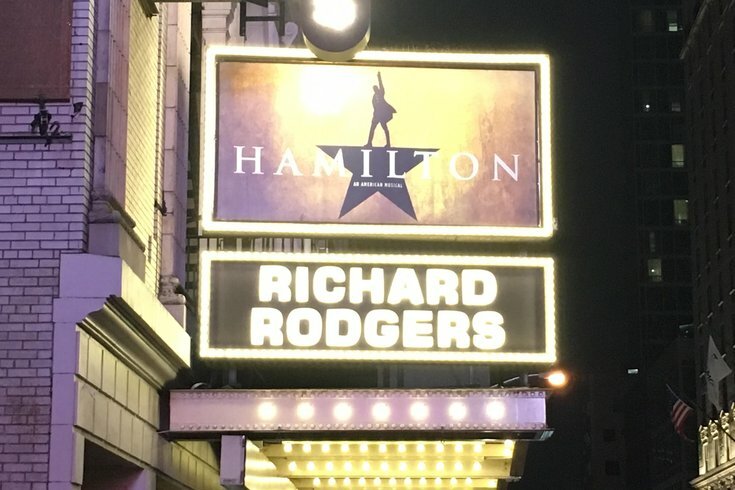 The Hamilton marquee on Broadway in New York City. Hamilton, Lin-Manuel Miranda’s hip-hop inflected musical reimagining of the life of founding founder Alexander Hamilton, is the biggest thing to hit Broadway in many years. It’s won a Pulitzer Prize, a record number of Tony Awards and a MacArthur Genius Grant for its creator. It’s grossed millions of dollars, spawned a best-selling cast album and now a star-studded mixtape, and even a Donald Trump-instigated Twitter feud. With Hamilton soon heading out on the road beyond Broadway, a lot of local Hamilton enthusiasts are hoping the show makes its way to Philadelphia sometime soon. The show has already announced in many other big cities. So when will we see Hamilton in Philly? According to the Kimmel Center, they’re working on it. “We have been in conversations with the show’s representatives to bring the performance to Philadelphia,” Kimmel Center spokeswoman Leslie Patterson-Tyler said, adding that talks are ongoing with the tour’s booking agent. “Many have asked about the touring schedule for this season’s mega-hit, Hamilton. Our city is a desirable market, and we continue to review the show’s availability,” she said. It begs the question – is there anything in particular holding up a deal? “There are no roadblocks, licensing issues, or any concerns. This is the normal process for booking performances on our campus,” Patterson-Tyler said. Hamilton is currently running on Broadway, and in Chicago, with a London production coming soon. It begins its national tour next spring, heading first to San Francisco, then to Washington, D.C., in June, and Los Angeles in August. The show’s website currently lists no fewer than 15 cities for Hamilton runs in the 2017-2018 season. Philadelphia isn’t one them, although several other cities are, including Atlanta, Boston, Las Vegas, St. Louis, Des Moines, Tempe and Costa Mesa, Calif. Each of those cities will presumably have a short run, although the show’s producer, Jeffrey Seller, told The New York Times last spring that Hamilton might eventually run in as many as seven companies in different cities, simultaneously. Several Hamilton scenes – including both cabinet battles, the Continental Congress and Constitutional Convention – are based on events that took place in Philadelphia. Leslie Odom, Jr., who originated the role of Aaron Burr, is a Philly native. Miranda, himself, has praised the city repeatedly, including during an address at the University of Pennsylvania last year. He played a supporting role in the short-lived NBC medical thriller, Do No Harm, which was filmed locally in 2012. There’s even now an app-based walking tour of significant Hamilton locations, developed by local writer Catherine Price. As for the Kimmel Center, back in October, it hosted a Q&A with Odom, followed by an early showing of PBS’ recent Hamilton’s America documentary. They even boast a Hamilton rooftop garden. In the meantime, the Kimmel Center has its Broadway calendar full – It will be hosting the likes of Mamma Mia, The Bodyguard, The Curious Incident of the Dog in the Night-time, The King and I, Cabaret, Hedwig and the Angry Inch, Dirty Dancing, Motown: The Musical, and Fun Home and Wicked, all between now and August.